Image Comics and Skybound Entertainment are thrilled to announce that the first issue of Daniel Warren Johnson’s (EXTREMITY) heavy metal action series MURDER FALCON is being fast-tracked for a second printing in order to keep up with overwhelming customer demand. 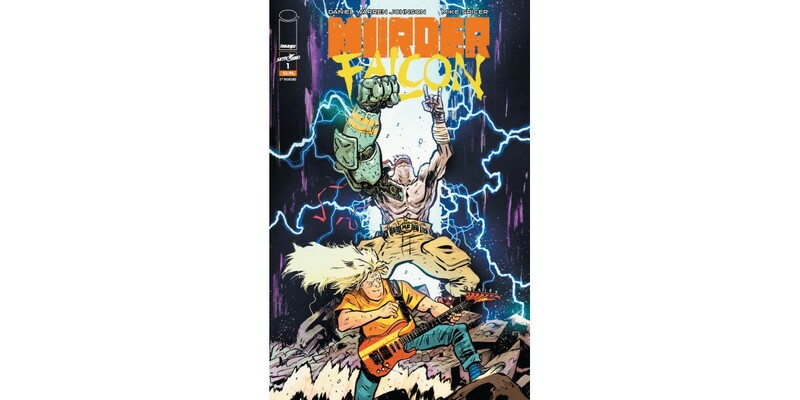 In MURDER FALCON, the world is under attack by monsters, and mega-talented guitarist Jake’s life is falling apart: no band, no girl, no future…until he meets Murder Falcon. He was sent from The Heavy to destroy all evil, but he can’t do it without Jake shredding up a storm. Now, with every chord Jake plays on his guitar, the power of metal fuels Murder Falcon into all-out kung fu fury on those that seek to conquer Earth. It’s time to shred! MURDER FALCON #1 will remain available for purchase across all digital platforms, including the Image Comics website (imagecomics.com), the official Image Comics iOS app, Comixology’s website (comixology.com), iOS, Android, and Google Play. MURDER FALCON #1 2nd printing (Diamond code: AUG188892) and MURDER FALCON #2, Cover A (Diamond code: SEP180192) and Cover B “Heavy Metal” variant by Andrei Bressan and Adriano Lucas (Diamond code: AUG188893), will be available on Wednesday, November 14th. The final order cutoff for comics retailers is Monday, October 22nd.